I'm not a big fan of Halloween. It's easily my least favorite holiday. I even like Ground Hogs Day more- I mean, you get to find out how much winter is left!!! I don't like scary things. I'm not a big fan of candy (but chocolate is a WHOLE different story!). And growing up we didn't go trick-or-treating because we were too busy having family fun at the local bowling alley. So Halloween is just "ok" in my book. Nothing to get too excited about, but then again, nothing to get upset about either. It's just "meh". This year, Bluejay and I were invited to a Halloween party with some dear friends. It didn't take too long to figure out what we were going to dress up as. Our inspiration came from our love OBSESSION with this show. GLEE is pretty much amazing! I may have had to force Bluejay to watch the first episode last season, but afterwards he said, "You know that exciting tingling feeling you get while watching an intense action movie? I felt that the WHOLE episode of Glee!" And we've watched it every week since. So, back to the costume. I was going to be Emma and dye my hair red and wear a cute bight colored monochromatic jcrew-ish outfit and Bluejay was going to perm his hair so that he could be Mr. Schuester complete with a skinny tie, a plaid shirt and cardigan sweater. It was perfect! Except that we ended up going to Bluejay's mom's house the night of the party and Bluejay's hair isn't long enough to perm. It WOULD have been fun. Maybe next year. Fast forward to Halloween Day. Bluejay and I went to check out the building progress on the apartment we were going to rent. It was going too slowly and some of the layout had changed which cause Bluejay and I to decide that it was no longer the loft for us. So, even though we are staying with friends for a couple more weeks, that left us in a bit of a panic as we had become COMPLETELY homeless and with no options! We spent the afternoon perusing Craigslist for apartments in the area that are available for immediate occupancy. As a result, neither Bluejay or I had a costume put together for another Halloween party that night with Campus Outreach students. Once the party started, Bluejay and I hung out in the garage with everyone, but felt dumb and underdressed without a disguise! I assessed our surroundings (in the garage) and I found a red saucer sled and a football helmet. I knew at once what we could be! With some scrap paper and markers Bluejay and I became... 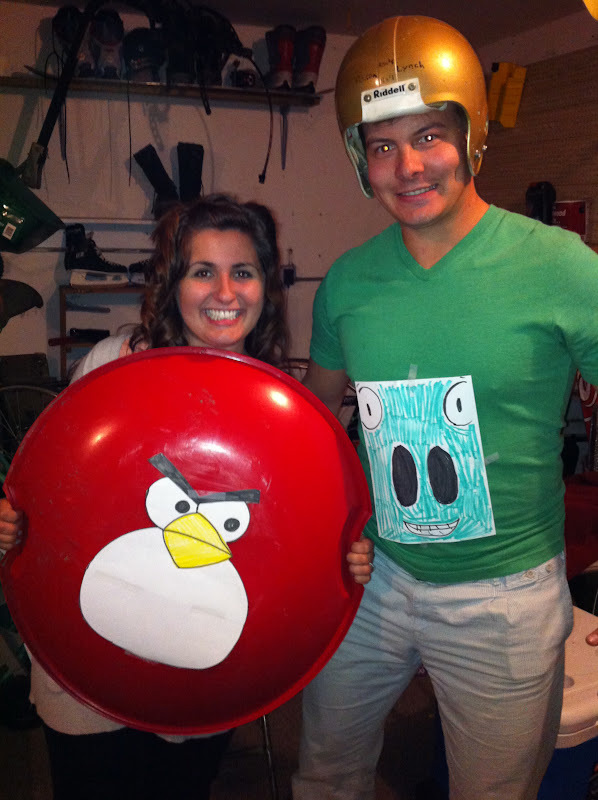 ANGRY BIRDS from the popular iPhone app that even I have to admit that I've wasted hours playing. From then on, we had so much fun and totally enjoyed the night filled with dancing, apple bobbing, pumpkin carving contest and round robin ping pong tournaments. Maybe Halloween isn't so bad after all. I carved this pumpkin with the help of about 6 other girls. 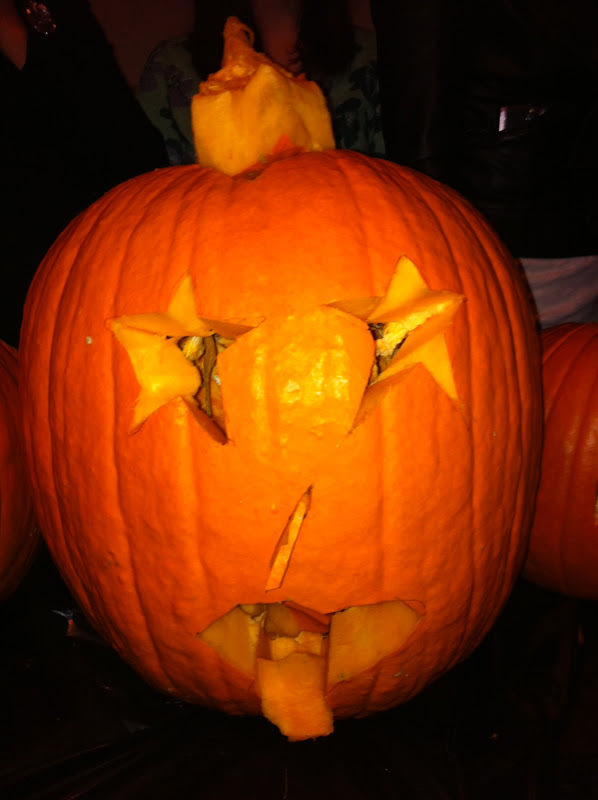 It's an 80's Rockstar/Kiss pumpkins sticking out his tongue. Pretty sweet, huh? And we won first place! The prize being bragging rights of course... and even better: blogging bragging rights! See you next year, suckers!